The position of grey squirrels in this country is ambiguous. On the one hand, they are charming intelligent animals, and many people enjoy watching and feeding them. On the other hand, they are, conventionally speaking, not native to this country, having been introduced from America in the 19th century. For this reason alone some people dislike them, and some actively persecute them and kill them. It is, unfortunately, perfectly legal to do so, because of their status as an introduced species; it is open season all the year round. The latest example of this persecution is a volunteer drive by a major environmental charity, the Royal Society of Wildlife Trusts, who aim to recruit 5000 volunteers and assign to them the duties of monitoring the population of the native red squirrel, as well as trapping, transferring to a bag and bludgeoning to death grey squirrels, in a misguided attempt to stop the decline of the reds. What I would like to do in response to this is to first of all present a few sound-bites of information about grey squirrels – not of the “they have bushy tails, they weigh 500g, they eat nuts” variety, but some things that caught my own imagination as I was reading up on various issues to do with grey squirrels. By the time I have finished giving these sound-bites it should become obvious why a spot-light should be shone on a certain paradigm in conservation, by which I mean a kind of ideological framework in conservation, into which facts are fed and out of which actions are taken, a paradigm which leads to the killing of grey squirrels and, more generally, to the killing of some animals in the name of helping others, in the name of conservation, in the name of helping nature. I believe this paradigm to be distinct from science, even though it often hides behind it, and I also believe it to be irrational, anthropocentric, and immoral. Tree squirrels (the genus Sciurus, comprising nearly 30 species) originated in Eurasia. They migrated to America about 9 million years ago, where they diverged into several local species. This colonization proved very successful, and several species emerged from that process: eastern fox squirrels, western grey squirrels, and, of course, our friends eastern grey squirrels, who were brought back to Eurasia, to Great Britain, in the 19th century. The squirrels that stayed behind in Eurasia, the red squirrels, are very common over an extremely large territory, from Scandinavia to Siberia to Turkey. Wherever the habitat is suitable for them, they thrive. Unfortunately, this is no longer the case in Britain, where the habitat is now unsuitable for them, due to deforestation. 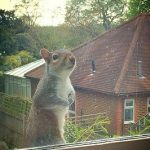 When it comes to housing, grey squirrels do not leave much to chance. They regularly use three or four dreys or dens. 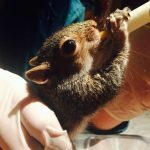 If one is destroyed, or, where there are babies in residence, when it becomes too dirty, the squirrels move to their second/third/fourth home. This is one of the reasons why they are so successful. Squirrels bury nuts. Everyone knows that. People used to think that they do it in a haphazard fashion and forget where most of them are. Nothing could be further from the truth. First of all, they remember, but also, before burying a nut, here are some of the things a grey squirrel has to consider: (a) the calorific value of the food: is the energy, in calories, of eating the nut in future going to be worth spending the calories in going to the place where it is buried, digging it out and opening it; (b) how long would the food last in the ground without rotting (in the case of acorns, a bit called the embryo has to be bitten in order for the acorn not to germinate too early); (c) pilfering, someone else might dig out the nut and steal it, so it is worth burying the larger nuts further apart – you will spend more energy getting them, but at least if you lose them to a thief, you do not lose everything valuable at once, the equivalent of investing money in a diverse portfolio; (d) predation, you do not want to be eaten by predators yourself while you are busy burying your food – on the other hand, a more dangerous place, perhaps a more open place, is safer from potential thieves. So the grey squirrel makes her decision, guided by her instinct and her intelligence. And a team of scientists, guided by reference books, computer models and supervisors confirm that her choice is indeed the optimum, given all of the above factors. Some acorns that grey squirrels gather are infested with larvae of weevils. Such acorns can by eaten (by squirrels, anyway), but not stored. 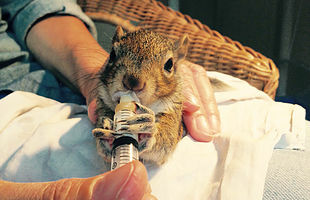 With no visual clues to infestation, squirrels are able to tell which acorns have the larvae in them and which do not. This ability of theirs exceeds researchers’ ability of determine infestation with x-rays. The mechanism for this amazing perception is unknown. It is more likely to be smell, rather than actual vision, since the squirrels were observed to shake their heads at the infested acorns. In any case, it works. Grey squirrels seem to be able to predict food availability and breed accordingly. Many trees display a pattern of producing seeds called masting, where an abundant crop one year if followed by up to 10 years of poor crops. This is nature’s own way of keeping down the numbers of seed-eater, squirrels among them. 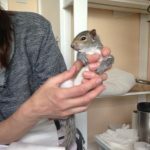 There is a hidden agenda in this, since people sometimes say that if we do not cull grey squirrels, there will be too many of them, we will be knee-deep in squirrels. Nature, however, has a way keeping down their numbers, even in the absence of predators, through food availability. But that does not mean that squirrel babies starve to death. Grey squirrels seem to know when food is going to be abundant, and have more babies in those years. More importantly still, they know when food is going to be scarce, and have fewer babies, if any, in those years. The mechanism for this prediction is unknown, though flower buds and the size of cones may be the cues. Squirrels communicate both vocally, e.g. by what sounds to us like clicks, moans and screeches, and non-vocally, by body language, e.g. by tail-flicking and flagging. 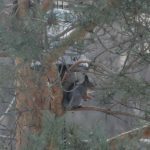 In urban areas, where there is a lot of noise, grey squirrels get around that problem by relying more on non-verbal methods, so that they can still communicate over the urban noise. The cognitive skills of grey squirrels are truly remarkable. They are very intelligent little animals, as anyone who watched them for any length of time would now. 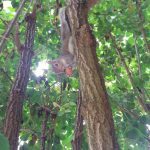 These skills have also attracted researchers’ interest, and in cognitive experiments grey squirrels demonstrate that they can problem-solve, solve counter-intuitive puzzles, tell colours, change their strategy when necessary and quickly learn from their mistakes. 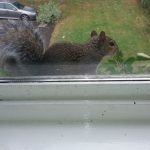 Grey squirrels also appear to have theory of mind, the ability to understand what someone else might be thinking and adjust your own behaviour to that. This capacity used to be attributed only to humans, it was even thought to be the distinctive feature of homo sapiens. Then it was begrudgingly granted to chimps. Now it appears that other animals, including grey squirrels, have it also. Theory of mind manifests itself most clearly in the ability to deceive. Grey squirrels have been observed deceptively burying nuts. If they think that a potential thief is watching, they make a big show of digging a hole, pretending to push in the nut and bury it – and then they run off and bury the nut somewhere else while the thief is uncovering the false cache. DOES SCIENCE TELL US TO KILL SQUIRRELS? But the really interesting thing about the sound bites is how these facts (neutral facts, from published, peer-reviewed scientific papers) can feed into entirely different attitudes. 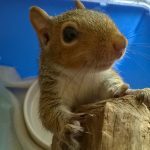 Some people, like me and others in grey squirrel rescue acknowledge these facts and think that grey squirrels are really wonderful and it is a great privilege to be able to help them. Others acknowledge exactly the same scientific facts, but draw the conclusion that grey squirrels are a formidable enemy and we have to work all the harder to destroy them, and we study them in order to destroy them more effectively. Most of the information I have given you so far in this essay, in a very positive light, actually comes from a book called The Grey Squirrel, Ecology and Management of an Invasive Species in Europe, published by the European Squirrel Initiative, who are certainly no friends of grey squirrels. The book does contains state of the art research, but the same scientific facts can be used in diametrically opposed paradigms: grey squirrels are amazing animals whom we help and admire, or grey squirrels are an enemy, all the more dangerous for being so clever. So if we play “spot the difference” with these two attitudes, the difference will not be in the science. Science does not tell us to kill squirrels. Science will give us information to make moral choices with, but it will not make moral choices for us. In a wider sense, science can make nuclear weapons, but it cannot tell us to use them, it can make cancer drugs, but it cannot tell us whom to give them to when resources are limited, science can tell us the cost of social care, but it cannot tell us whether the state or relatives should pay for it. 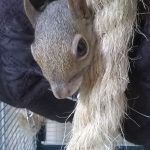 In a more narrow sense, science can tell us, for example, that in certain habitats grey squirrels have competitive advantage over red squirrels, but it cannot tell us to artificially maintain colonies of red squirrels, like a large zoo, and to kill grey squirrels. That is moral decision-making, and it is done on a different level. There is a tendency nowadays to put science in the position that religion occupied in the old days – something that will make decisions for us, so that we do not have to think for ourselves or struggle with moral dilemmas. 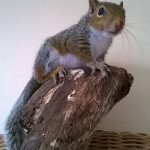 So, to me, the elephant in the room, or the giant squirrel in the room, if you perfer, is the world-view paradigm in conservation that leads people to kill grey squirrels in order to help red ones, to kill some animals in order to help others, to help nature in general. This is, unfortunately, traditional mainstream conservation, and it is this paradigm that Wildlife Trusts follow in recruiting volunteers to kill grey squirrels. As I said earlier, I believe this traditional conservation paradigm to be anthropocentric, irrational and immoral. These are not empty insults; I will consider them one by one. Anthropocentric means, essentially, human-centered. Just as this photo centers on the squirrel, Akon, though the human is also in the picture, the conservation paradigm that I have an issue with centers on the human agenda, though the animals are also in the picture. Historically this conservation started with people protecting trees – for more efficient human use, protecting beauty spots – for the enjoyment of future generations of humans, protecting animals – for hunters to kill. In relation to animals in particular it started with game-keepers in this country looking after the land for hunting, and big game hunters in Africa looking after the land and the animals to preserve their ghoulish playground in the best condition possible. This kind of conservation may look after the ecosystem very well, especially if it is well informed and free from corruption (although it is, admittedly, a big if), but it is done for the benefit of the human without any consideration for the life and welfare of individual animals – only species, at best. With time, this conservation paradigm did evolve, but only in the sense that it is not necessarily about hunting any more. Ostensibly, it is about protecting nature, but it still assumes that the human knows best what is good for nature, so the conservation paradigm still centers on the human agenda and thus remains anthropocentric. It is a kind of “White Man’s Burden”, but in relation to nature. The poem that I am referring to, “The White Man’s Burden”, is by the English poet Rudyard Kipling, and it called upon colonial nations to conquer and rule non-white peoples: for their own good, because they are incapable of governing themselves, and need the colonial powers to bring to them the benefits of civilization. Now, just over 100 years on, we are not even angry about this any more, we just cringe at the arrogance of this call to “take up the white man’s burden”. But this same arrogant attitude has now been transferred to nature. We assume that nature cannot preserve and protect itself and that we need to help it, for instance, by artificially maintaining colonies of red squirrels in habitats that are no longer suitable for them (with extensive captive breeding programmes, relocations, reintroductions, supplementary feeding – like a large zoo), while continuously culling the more adaptable grey squirrels who happen to come close to that project. The buzz word is biodiversity, but in practice it means that humans decide which species are good for the ecosystem and which are not, and “manage” it accordingly. The thing is, nature can manage itself very well without us. It seems that the best thing we can do for nature is to leave it alone. A rather stark illustration of this is the Chernobyl nuclear disaster. It happened about 30 years ago, on the territory of the former Soviet Union. The reactor that was affected had to be encased in concrete and buried underground, and an exclusion zone had to be created around it. The radioactive contamination there is so high that humans can never live there again. Scientists and journalists can go in there for short periods of time, but that is all. Animals, however, moved into the exclusion zone, and are thriving, both prey and predator species. It is a humbling thought that if we just leave nature alone, even in the worst ecological state imaginable, that of nuclear contamination, the ecosystem can resurrect itself and balance itself out. Actually, the level of predation in the exclusion zone is seven times higher than in the comparable managed reserve of Byelovezha nearby, but the prey species still thrive. Nature does not always balance itself out in the way we think it should, but balance itself out it does. 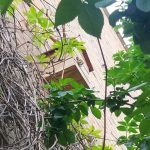 This point, that nature is resilient, and the best thing we can do for it is leave it alone, is developed by Fred Pearce, an award-winning environmental journalist, in his book called The New Wild, subtitle Why Invasive Species Will be Nature’s Salvation. The author shows again and again, by many examples, how nature resurrects itself and even deals with the ecological mess we create, very often using the very species that traditional conservation deems “alien” and “invasive” and tries to eliminate. 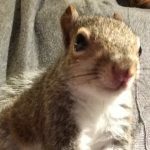 Not only is the kind of conservation that kills grey squirrels to help red ones anthropocentric, it is also irrational, because of the emphasis it puts on the whole native versus alien narrative, the fact that grey squirrels are not native to this country, but were introduced from America in the 19th century. This emphasis on nativeness is irrational, because it is purely a question of fashion. In the 19th century the fashion was to collect animals and plants from all over the British Empire and to try to establish them on different continents. It was called acclimatization, and it was very popular. Now the pendulum of fashion has swung in the opposite direction, and introduced species are persecuted simply for “not belonging here”, even though they do no harm whatsoever and contribute to the very biodiversity that is such a buzz-word nowadays. They are routinely accused of various crimes against the ecosystem, though these accusation invariably prove wrong when investigated properly. For instance, grey squirrels are accused of reducing the bird population. 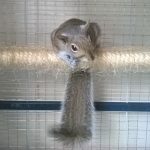 It is true that squirrels, both grey and red, are opportunistic feeders, and may take an egg if they come across an unattended nest, so people may see them doing that. But they are not predators and what they do is statistically negligible. An extensive government-funded monitoring programme has concluded that grey squirrels do not reduce the bird population, so it is time to lay that particular myth to rest. Another accusation is that they destroy trees. Once again, it is true that both red and grey squirrels feed on trees, but they do not destroy them, only change their physical appearance. In a small number of cases the bark stripping can allow disease to get in, and the tree dies and falls down. But then it becomes a very valuable wildlife habitat, and the squirrels plant new trees by caching seeds and nuts. Squirrels are some of nature’s greatest conservationists that regenerate forests. Even in commercial forestry the accusation does not stand. The Forestry Commission conducted an investigation into grey squirrel damage. No doubt they were hoping to find another excuse to kill them. But the result was only 5% damage, less than damage due to poor growing practices, such as lack of thinning. But the queen of the irrational accusations is that grey squirrels replace the native red. This is quite a slippery one, because when we say or read that “the greys have replaced the reds”, it is important to unpack exactly what is meant. If we mean “first there were lots of red squirrels, and now there are lots of grey squirrels, and very few reds”, it is true. If we mean “in certain habitats grey squirrels have competitive advantage over red ones”, it is once again true. If, however, we mean that “there were lots of red squirrels, and then the greys were introduced and fought them, and killed them, and pushed them out”, it is false. In this country the red squirrels became very rare, to the point of extinction, by the end of the 18th century, before the greys were introduced. It happened because of deforestation, because of habitat loss, as a result of human activity, particularly in the Industrial Revolution. Red squirrels need a very specific habitat in order to survive, namely extensive (thousands of acres) pine forests, or equivalent in wildlife corridors, and when this habitat was no longer available to them in this country, their numbers crashed. The red squirrels were then reintroduced from Scandinavia, and, to this day, attempts are being made to artificially maintain their colonies. In the meantime, greys were introduced, who happened to be far more adaptable. They can thrive in the conditions of deforestation that exist in this country, and can even adapt to urban conditions. But, instead of being grateful that nature has found some squirrels that can cope with the ecological mess we create, we persecute the very species that has simply won the game of the survival of the fittest. This is the origin of the reference to six-day creation in the title of the essay. It is not a dig at Christianity, I am a believer myself, but it strikes me that, just as six-day creationists deny evolution by their words, traditional conservationists deny evolution by their actions, by fighting natural selection. Since thinking up the title as a bit of a joke, I actually discovered that the conceptual framework of native-alien-invasive predates the Darwinian theory, predates ecology, predates genetics. So we are trying to stuff 21st century science, state-of-the-art science, into a pre-Darwinian philosophical framework, which is irrational. Just as it is irrational to artificially maintain red squirrels – a species that is not endangered, or rare, in the rest of the world (their conservation status is “least concern”) in habitats that are no longer suitable for them, while attempting to kill off grey squirrels who are well adapted for the habitat and well established within it. If the artificial maintenance is done by benign means, by reforestation or creating island safe havens, it is one thing. If it is done by continuous killing of greys, it becomes a moral issue. The basic question here is, “Is it appropriate at all to talk about morality in relation to non-human animals?”, “Do animals deserve moral consideration?”, because, if they do, it follows that killing them is a moral issue, since the talking of life is the greatest moral outrage one can commit against a creature. This question is often approached from the angle of “Why should animals be given moral consideration?” It seems to me that it is more appropriate to approach it from the angle of “Why should they not be given moral consideration?” It is natural to start a philosophical discussion from where most people are at, and most people, if they see, for example, someone kicking a puppy, do not think, “This person is damaging someone’s property”, or “This person is displaying a bad character”, but, “This person is committing a moral outrage”. The main reason we put up with animal suffering is that it happens out of sight, in slaughter houses, in wildlife culls, in laboratories. It is quite deliberately kept out of the public eye, so we are culturally conditioned to accept it, culturally desensitized to it. Whereas if we actually saw the animal suffering in front of us, we would react both emotionally – feel sorry for the animals, and intellectually – we would remember that there is, after all, neurologically nothing specifically human about the experience of pain, fear and suffering. The counter-argument is sometimes advanced that the animals do not really know what is happening to them. Actually, in many cases they do, but even when they do not, there is the argument from marginal human cases – babies do not understand the context within which they might suffer, people with severe dementia do not know what is happening to them, but that does not mean that it is right to kill them. Another concept that creeps into the discussion and is, I think, very dangerous, is “humane killing”. It is not in fact humane in the way it is practiced in culls and slaughter houses, because the only humane killing is by lethal injection. But even if the death is painless, there is still the argument from foreclosed life opportunities. All of us would prefer to die painlessly, rather than painfully, but the overwhelming consideration is, we would rather not die at all! At least, not for a long time. If someone dies before the age of 70 or 80, we think that somehow they missed out on some things in life. And it is the same for animals, if the death is unnatural and early, it forecloses the animal’s life opportunities, which makes it a moral issue. The origin of tree squirrels: Scheibe and N. Moncrief, ‘Morphometric divergence and functional similarity in Sciurus vulgaris and Sciurus carolinensis’, in C. Shuttleworth et al. 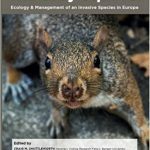 (ed), The Grey Squirrel, Ecology and Management of an Invasive Species in Europe, European Squirrel Initiative, 2016, p. 90. X-ray vision: Steele and L. Wauters, ‘Diet and food hoarding in eastern grey squirrels (Sciurus carolinensis): Implications for an invasive advantage’, in C. Shuttleworth et al. (ed), The Grey Squirrel, Ecology and Management of an Invasive Species in Europe, European Squirrel Initiative, 2016, p. 106. Breeding in accordance with food availability: Gurnell et al., Squirrels, the Mammal Society, 2012, p. 15-16. 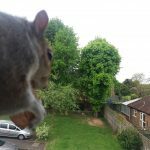 Communicating over urban noise: Merrick et al., ‘Urban grey squirrel ecology, associated impacts, and management challenges’, in C. Shuttleworth et al. (ed), The Grey Squirrel, Ecology and Management of an Invasive Species in Europe, European Squirrel Initiative, 2016, p. 65. 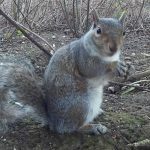 Grey squirrels’ cognitive skills: Chow et al., 2016, ‘How practice makes perfect: The role of persistence, flexibility and learning in problem-solving efficiency’, Animal Behaviour, 112, 273-283; Chow et al., 2015, ‘Serial Reversal Learning in Gray Squirrels: Learning Efficiency as a Function of Learning and Change of Tactics’, Journal of Experimental Psychology: Animal Learning and Cognition, 41, 343-353; Chow et al., 2017, ‘Touchscreen assays of behavioural flexibility and error characteristics in grey squirrels (Sciurus carolinensis)’, Animal Cognition, 20, 459-471. Grey squirrels do not reduce the bird population: http://news.bbc.co.uk/earth/hi/earth_news/newsid_8448000/8448807.stm (accessed 07/06/2017). Grey squirrels do not destroy trees: https://www.forestry.gov.uk/pdf/fcpn004.pdf/$file/fcpn004.pdf (accessed 07/06/2017). Red squirrels decline in the 18th century, before the greys were introduced: Harris, et al., ‘Is culling of grey squirrels a viable tactic to conserve red squirrel populations?’, Bristol University, 2008. Suitable habitat for red squirrels: Kenward and Holm, ‘On the replacement of the red squirrel in Britain:a phytotoxic explanation.’, Proceedings of the Royal Society, Biological Sciences, 1993. Reintroductions of red squirrels from Scandinavia: Hale, et al., ‘Patterns of genetic diversity in the red squirrel (Sciurus vulgaris L.): Footprints of biogeographic history and artificial introductions.’, University of Newcastle, 2003. Culling grey squirrels an inappropriate way to help red squirrels: Harris, et al., ‘Is culling of grey squirrels a viable tactic to conserve red squirrel populations?’, Bristol University, 2008.